Poker was first played for real money over the internet around twenty years ago, with hundreds of operators offering different models for protecting player funds. Over this time, hundreds of millions of dollars have been lost through a combination of online poker sites inappropriately spending player funds, and through intermediate payment processors taking money (either in accordance with court orders, or in contravention of the law). Some of these cases have become famous: many millions of poker players lost money at Full Tilt Poker, Lock Poker, Purple Lounge, Absolute Poker, Ultimate Bet, PokerSpot, PKR, and elsewhere. In other cases, few poker players would know of behind-the-scenes payment processors who have been accused of taking money from customers trying to deposit to online poker sites, but not remitting that money to the poker sites. In those cases, online poker sites have typically covered up the shortfall out of their operating funds, but in the case of Full Tilt Poker, their alleged Ponzi scheme ended when the US Government stopped players from even attempting to deposit on that site. 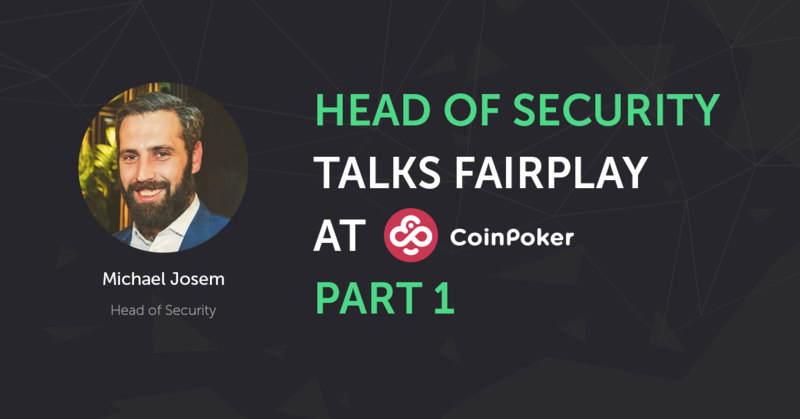 By operating a transparent wallet on a public blockchain, CoinPoker will change that paradigm in two ways: firstly, the location of the CHPs will be transparently visible to anyone and secondly, players will be able to trade for CHPs with whoever they wish — a player will be able to trade them with friends, businesses or even strangers. In that way, they will no longer be held hostage to slow transaction times that vary internationally, but rather, will be able to choose what suits them. Not only will this competitive pressure give players more options, but the irreversible nature of blockchain transfers means that your CHPs are credited to your account with very little risk — and that a player who chooses to use a credit or debit card to purchase CHPs (such as from a third-party exchange) can choose exactly which payment processor sees their card number. Formerly, legacy poker operators forced customers to use the processor that theywanted to use, and while they normally meant well, fraud remains a significant risk with customer information being transmitted out of their control to third-parties. As CHP will be a truly open peer-to-peer market on the Ethereum blockchain, players will also be able to benefit from the open competition pushing down foreign currency exchange fees. While legacy poker operators continue to operate today using a global reserve currency such as US Dollars, very few poker players live in countries where US Dollars are useful. As a result, customers who do not deposit from US Dollar accounts are often slugged with expensive currency conversion fees, with players having no way to avoid them. These fees can represent a hidden additional fee for many customers. For example, a New Zealand customer who deposits to a legacy online poker site using her New Zealand Dollar debit card can be treated in two ways: either the site can charge her in the site’s main currency of US Dollar (and thus, her bank charges a foreign exchange fee) or the site can charge her in New Zealand Dollar (and thus, choose the exchange rate, sometimes without her knowing the fees implicit in the exchange rate). Similarly, German customers of legacy online poker sites who use ELV, or British customers using PayPal, and so on, will also face a variety of fees that may be opaque, confusing and prevent poker players from making informed choices. Because CHP will be traded openly using modern blockchain technologies, poker players will be able to buy CHPs from anyone that they want. In many cases, players will buy the tokens from online exchanges using the payment method of their choice, and can easily shop around without restriction for the best rate. In other cases, players will be able to buy tokens from friends, family members, and anyone else — putting players back in the driving seat of this important but often hidden part of the online poker economy. Previous Post Six Days Into the CoinPoker Pre-ICO and We’re Already Sold Out!